Meet our world class 316 Ti-Alloy, medium-lightweight, stainless steel relining system. Its superb features, great price, transferable lifetime warranty, and the HomeSaver name set it apart from all other liners. HomeSaver Pro is extremely flexible. It coils and uncoils much easier than any other brand, except UltraPro. Thirty feet of 12" diameter liner coils easily to a diameter of less than six feet and weighs less than 60 pounds! And you won't need two neighbors and an ox to uncoil it. It's rugged too- lightweight does not mean light duty. HomeSaver Pro's .006" strip is 20% stronger than other lightweight liners. 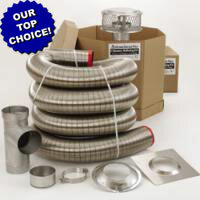 Insulated HomeSaver Pro is UL listed to the 1777 Standard for zero clearance in 6"-12" diameters. Insulate with our 1/2" Foil-Face FlexWrap to meet the UL 1777 Zero Clearance listing.